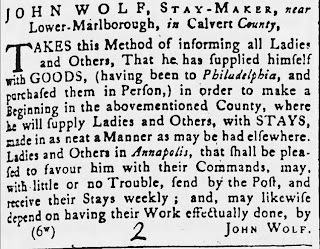 Mr. John Wolf's advertisment as a Stay-Maker also includes stays by mail order! Guaranteeing delivery weekly in as neat a manner as his competetion when sending by the post. Well, I have my stays too -- and it only took a year (although I did request a remeasure after about 9 months of waiting due to a weight change). Relatively satisfied.